Gone Fishing! 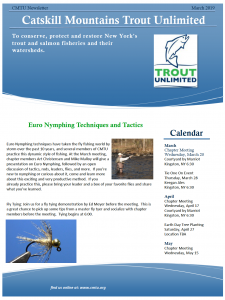 Instead of a chapter meeting this month, Catskill Mountains Trout Unlimited with be meeting on the Esopus Creek. Please join us. Open to members and non-members of all skill levels. It is a great chance to meet other members and most importantly fish. If you are interested, we will be meeting at the Phoenicia Diner on Route 28 at 6:30 PM on Wednesday June 20th.